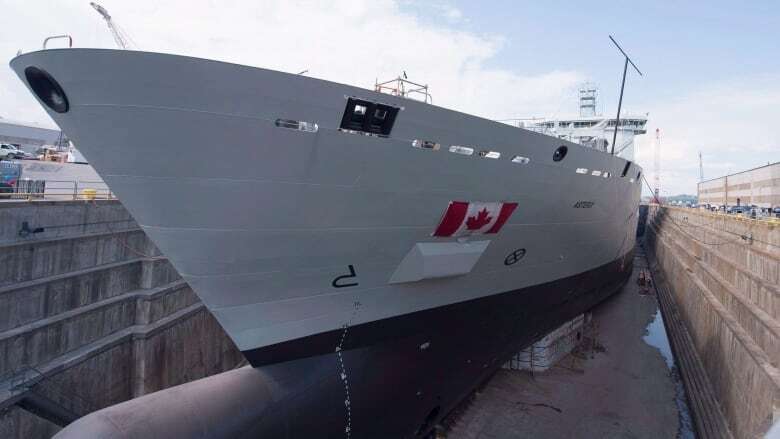 A Quebec shipyard accused of being on the receiving end of leaks in the criminal case involving Vice-Admiral Mark Norman was mistakenly given a series of secret cabinet documents last summer, CBC News has learned. The Davie shipyard in Levis, Que. was instructed by the Liberal government to return the records — which related to a $610 million contract to acquire and convert three icebreakers for use by the Canadian Coast Guard — and to refrain from talking about the blunder. Federal government and defence industry sources with knowledge of the file, who were not authorized to speak publicly, said the company complied with the request. The federal Treasury Board sent the records to the company last July, asking for its blessing to release information related to the project under what's known in Access to Information law as 'third-party disclosure'. Included in the package was a series of uncensored assessments that revealed the federal government's negotiating position in the run-up to the sole-sourced icebreaker contract last June — material that would have formed the basis of cabinet discussions. In an unsigned statement, Treasury Board confirmed the gaffe on Monday but downplayed its impact. It described the incident as "a breach of sensitive information" to which it responded quickly. "As soon as we became aware that documents had been inadvertently disclosed, we took immediate mitigation measures, including contacting the third party to retrieve the documents and launching an investigation," said the statement. "The internal security investigation found that the incident was caused by human error." It's an embarrassing mistake in light of the ongoing criminal case against Norman, the military's former second-in-command, who is accused of leaking cabinet secrets to Davie prior to the 2015 signing of a separate $668 million contract to lease a supply ship to the navy. It was then-Treasury Board President Scott Brison who told the RCMP in early 2016 that the leaks to the shipyard in that instance were among the worst he'd seen as a federal cabinet minister, claiming they undermined the government's ability to exercise due diligence. Norman's lawyers have called into question the integrity of the federal Access to Information system at the Department of National Defence, alleging officials used code words and military short-form titles to avoid answering requests for documents associated with Norman's case. Both the mistake at Treasury Board and the controversy at DND point to an Access to Information system that is badly in need of repair, said one expert. "The information system is leaky, broken and inefficient," said Sean Holman, an assistant professor at Mount Royal University in Calgary who is writing a book on freedom of information law. "What's important for Canadians to understand," he said, citing the inadvertent leaks, "is that this kind of slippage happens all the time." Sources tell CBC News that once the Davie officials realized what they were seeing, the shipyard executives made arrangements to return the documents. A spokesman for the company confirmed that and described what happened as a mistake. "There are often errors when it comes to disclosing cabinet confidences," said Frederik Boisvert. "Upon our review of the document, we recognized the error in the disclosure and immediately alerted the appropriate government officials and returned the document." The sources said the slip-up happened after negotiations over the icebreakers concluded and the company saw no benefit whatsoever from getting an inside glimpse of the government's negotiating position. Boisvert did not comment on that assertion. Negotiations to acquire the three icebreakers started a year ago, after Prime Minister Justin Trudeau abruptly announced the plan in a Radio-Canada interview in Quebec City. How the information gaffe will affect the Norman case remains to be seen. "[Norman's] lawyers are right, but will that help him? I don't think so," said Holman. "The rules of the system still exist," he added — and they prohibit releasing cabinet confidences. Holman said there's irony in how the federal Access to Information system has evolved. It was established, he said, decades ago partly in response to a series of unauthorized leaks plaguing the Liberal government of the day — under Prime Minister Pierre Trudeau.